I made some cute knitting bags, and if you make it through this whole post, there's information on how to do it. There's a particular forum post I have been drawn to a few times over the past year. I guess this is a part II, actually (link here if you're on Ravelry). 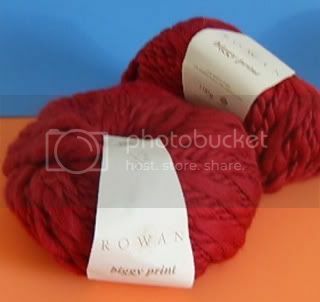 It's a way for people to get rid of yarn they no longer want (perhaps you had an extra skein leftover after a project and never want to see that yarn again) and get a little package of goodies in return. You work out a direct exchange. It's fun! 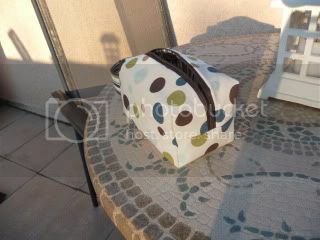 In exchange, I offered to make the other woman a sock knitting bag, meaning a small bag for sock projects. I have lots of fabric and I loves me some bags! 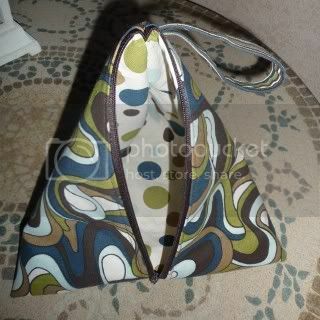 The pyramid bag is pretty cool, but a bit big for a sock project bag. 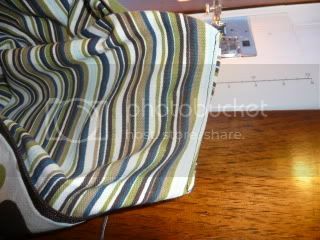 I got the tutorial from Nicole Mallalieu, who makes great bags. I just increased the size of my pattern pieces to 11" x 22", but maybe should have gone a little smaller. The square bag came from two tutorials, mainly this one on Drago[knit]fly, but I also borrowed some modifications from this one on 20 Acres and No Sheep. 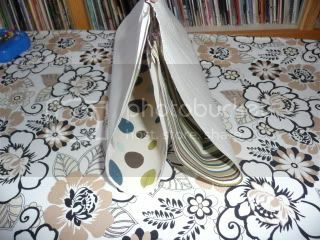 Mainly, the modification was the cut out corners, which I think are easier to work with than the first tutorial's way. The thing is, all the box bag tutorials I found end up sewing the outer fabric and lining as one piece, and therefore have raw seams inside. I can't allow raw seams, so I had to modify the bag. 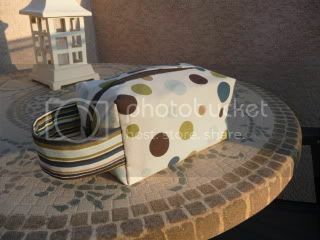 I'm going to do a really rough tutorial on how to make a box bag without raw seams. It might help to check out the original tutorials above for more detail, and then apply my changes. And, this will probably be hard for me to explain. As always, I welcome emails if you have any questions. My email link is up there on the top right of my blog. 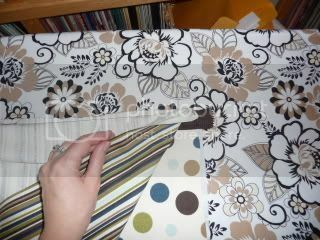 Cut one piece of outer fabric, one piece of lining fabric and one piece of interfacing (I use Craft Fuse) 16"x12". 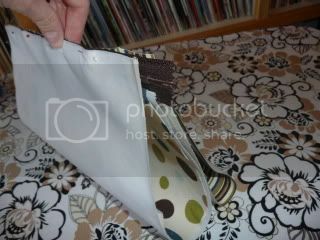 Fuse the interfacing to the wrong side of the outer bag piece. I used a 1/2" seam allowance all the way through, except on the zipper. There I just sewed as close as I could. 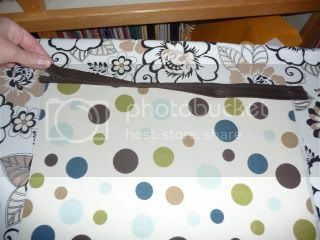 Next, place a 12" zipper along one of the short sides of the outer fabric, right sides together (zipper pull is facing the fabric). Sew. I am lazy and just use a regular zigzag presser foot, with the needle to the left. I recommend you start and stop half an inch from each end. You'll see why later. 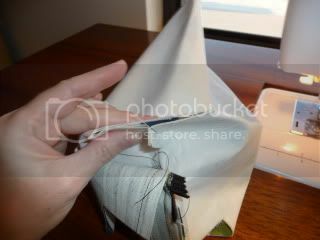 Next, take the lining piece and place it on the other side of the zipper, so the right sides of the fabrics are together and the zipper is sandwiched between them. Sew as you did above. Open it up and turn it so wrong sides of fabric are together, and press away from zipper. Top stitch next to zipper (I forgot to do this). Here, it gets momentarily weird. OK, it gets even weirder later. But stay with me. Sew along zipper, then turn right side out. Your two side edges are still open. Here's where you'll be glad you stopped a little before the end when sewing the zipper. I didn't, and I had to rip a few stitches out to make this work. 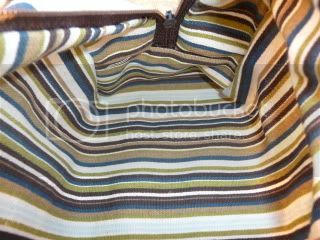 OK, turn your bag inside out again and separate your lining from the outer bag. 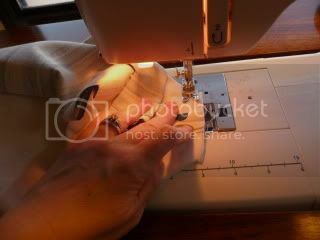 Grab your outer piece and line it up so that the zipper is in the center. 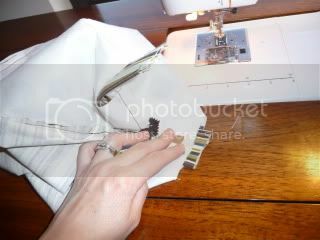 Move the lining out of the way as best you can and sew all the way from end to end. Do the same on the other end. I think that it was around this point that I just went ahead and opened the zipper up. Later, you'll be very glad you did. 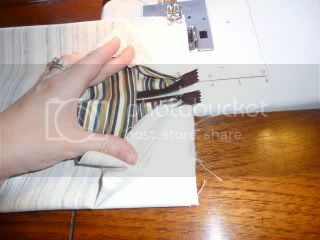 Next, grab the lining in the same manner. On the side with the zipper pull, sew all the way across. On the other side, without the zipper pull, sew most of the way across, but leave maybe 2 or 2.5 inches for a turning hole, as shown. I am going to call this "Corner A" below. Next, we're going to cut squares out of the corners. This is going to help us make the boxy shape. I cut 1.5 inch squares out of each corner, but I started measuring at the seam, not the raw edge. Draw the lines right on there with a pencil or fabric pen. Cut all of your corners out. 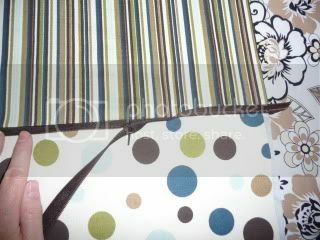 I'm not really worried that I'm cutting across a seam because I'm going to sew back over it in just a second. Do the same on the other side, only you need to insert the strap here. What? I never mentioned the strap before. Oops. You can get an explanation on the other blog, but basically you'll cut a piece of fabric 10"x8". Fold in half, right sides together. Then turn right-side out and press. 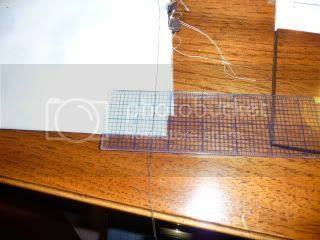 Fold in half again lengthwise and sew open end and top stitch folded end. 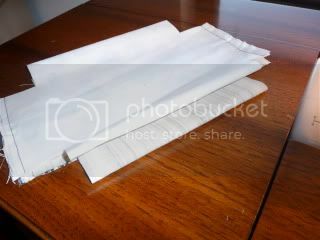 Now you've got your strap, so you want to insert it into the bag so that the ends of the strap are poking out of the cut-out corners of your outer piece, on the zipper end side. 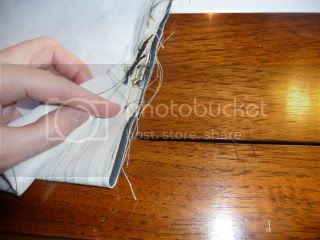 Then pinch the corners and sew as you did on the other end, but this time you'll have the strap sandwiched in there, too. Now do the same all of the lining corners EXCEPT the corner with where you stopped sewing early (Corner A, remember him?). This will be your turning hole. Your bag should look like a hot mess. BUT ... turn it through that little hole so that it's right-side out. Go slow, so you don't tear the seam any farther. 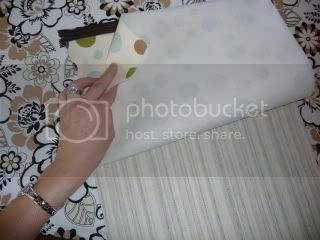 When it's turned around, stick your fingers through the hole and poke out all the corners in the outer bag. 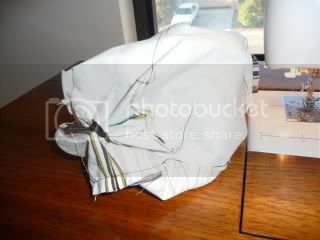 If it all looks good, pull that open corner of the lining back out and pinch it together and sew from the outside. Sure, it's not perfect, but I prefer one slightly icky seam to a bunch of raw edges, myself. If you're that picky, just slip stitch it by hand for an invisible look. Press and steam a bit, and you'll have this! And a nicely finished interior! Yippee! Now got start knitting some socks. Carry them around. Go in public. Look all cute. 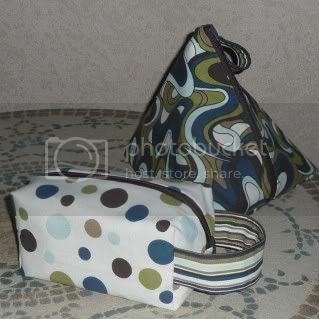 Those are such cool bags... thanks for that - would love to make the little rectangular one. I'm itchin' to make one - thanks for the tutorial! I'd happily trade sock yarn for a pair of cute bags! Guess I'll have to sew myself some. Thank you, Thank you! I have over the past few days followed 3 different tutorials only to weep and throw out the results...before coming across yours that is. Now my knitting has a lovely zippered, fully lined home with no hideous visible seams inside. You've completely saved my sanity! I can't thank you enough! I'll try yours. I love the fact that it won't have raw seams. That's great!! Can you tell me the finished size of the bag? I'm afraid that I don't have the bags anymore (they were a gift) and so I'm not sure if the dimensions. Sorry! I must say this is wonderful for two reasons; the first being the relative ease of this tutorial. I really want to sew something quick, easy, and stylish so that I might take my knitting with me. And the second being I too detest raw edges. I simply can't have them. I had been working on a way to eliminate them on that selfsame tutorial, but I must say I adore your way. Robyn, thank you, thank you for the tutorial! 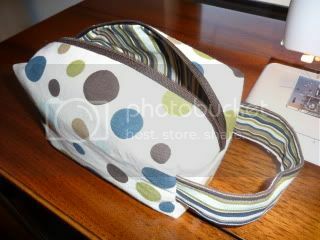 I was fiddling around with the Hot Patterns Cosmetic bag yesterday and trying to make it so it didn't have those exposed seams...it worked okay. But then, I came across your tutorial and was up bright and early this morning making another! I lined mine with laminated cotton...LOVELY! Thanks again! Thanks so much for this tutorial. I've made a few box bags, and the raw edges always bothered me. 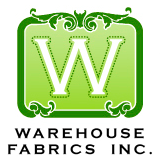 Your technique is easy and makes for a much better finished project. I just made two bags with your tutorial, and I'm very pleased with them. Thanks! 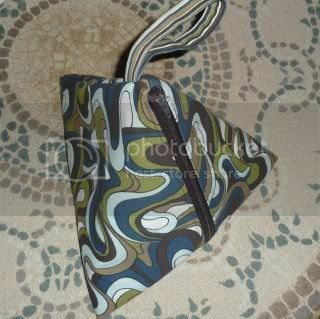 I've found the link to the Pyramid purse: http://tinyurl.com/6bfrsvm . This is via WayBackMachine.org, which archives old websites. There is a PDF download available at that site. Thank you for your instructions. These are great little bags! Thank you sooooooo so so so so so much. I just made one and it is so incredibly cute. I am going to go make another one. I love it so much. Admittedly, I got a little confused a couple of times during this tutorial, BUT I am finished and it looks pretty good for what little experience I have with bag making. I appreciate you linking to the other tutorials, because it helped me piece together the confusing sections. Thanks!! Thank you so much for the tutorial. I have been wanting to make a square pouch for my knitting for ages. Before my knitting obsession began I was addicted to collecting fabric, so this was a perfect opportunity to combine the two loves. Easy to follow and worked a charm. Thank you again. Thank you for the tutorial. It was very easy to follow. 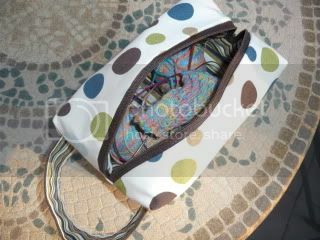 My first bag became so cute, and I will give it to my 4-year old daughter, who choosed a fabric with dolphins. Thanks for this tutorial. 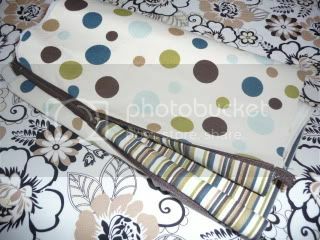 I can't wait to start making the bag. Can you tell me what the size of the finished bag is? I'm sorry that I didn't provide finished dimensions. It's been so long that I have no idea. I gave those bags away as gifts. Sorry! Great tutorial. I love my project bags...sewing for my knitting is a little like cleaning my vacuum with another vacuum (something I do often!)!!! Thank you for a wonderful tutorial. 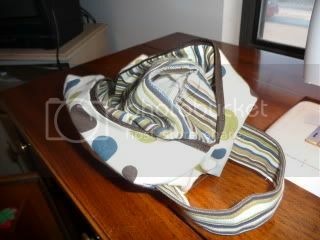 I see myself using up my cute fabrics and making many little bags. 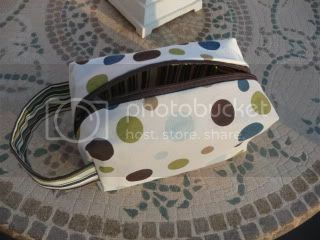 These would also be great as shoe bags for the non-knitter or traveler in your life. Fall is in the air my napkins.